The on-line methods dehydrate the paper insulation via insulation oil. The idea is premised on the migration of diffused moisture that takes place between the paper and the oil insulation at normal operating temperatures of power transformers. To the extent that the oil is dehydrated over an extended period of time—the migration is slow—it becomes possible to reduce the moisture in the paper insulation. A revolutionary technology to keep moisture levels low to extend the life of a transformer that is widely used today was developed by DryKeep® and is based on molecular sieve adsorption process. Transformer oil is circulated through a series of cylinders filled with a granular ceramic material (molecular sieve) that removes moisture diffused in the transformer oil. The medium permits slow and gentle moisture removal, compatible with the pace of the migration between the insulation paper and the oil, and effectively retains trapped moisture when the cylinders become saturated. The molecular sieve process is designed for permanent use on a transformer. The system is all stainless steel construction. Besides one or three dehydration cylinders, the basic system design comprises only a small circulation pump, along with oil particle filter and de-aerator. The system is frequently installed directly on the transformer, usually on the side of the main tank, or on a cooler (radiator). It can also be mounted on a freestanding rack. Permanent plumbing is used for the connections. The location of the insertion point in the transformer’s oil systems is not critical. It is usually most convenient to extract the wet oil from the transformer drain valve and return the dried oil through the fill valve. The frequency with which cylinders are replaced depends on the amount of moisture removed-every few months on a large, wet transformer, every five or six years on a new or recently dried out unit. The ceramic medium used in the cylinders can be regenerated. It does not allow the adsorbed moisture to flow back into the transformer. In the dehydration of a wet transformer, the systems can be set to gradually reduce the moisture level in the paper insulation to a predetermined level in order to safeguard against the possibility of “over-drying” and consequent possible need for re-clamping. This is a safe level dielectrically and if maintained slows insulation aging considerably. The SMART* systems are equipped with moisture sensors to monitor the progress. Compared to the direct cost associated with off-line dehydration, the on-line system solutions are highly economical to purchase and use. A field installation of a molecular sieve system will dry out a wet transformer at approximately one-fifth the cost of conventional vapor phase dehydration at a service facility, and at one-third the cost typically associated with an on-site heat-and-vacuum process. The oil dehydration rates of the on-line systems are contingent on many factors: operating, principle, moisture content of the oil, the oil’s temperature, viscosity, and the stability, the types of additives present in the oil, and others. However, lowering the moisture content in the paper insulation is ultimately linked to the rates at which moisture migrates from the paper and is diffused into the oil during normal transformer operation. It is a slow, steady, and gentle process. The oil can be dried in a matter of days or weeks, but bringing the paper from a wet condition to 1.3 percent, most likely will require many months. Which brings us to the important new benefit of permanent, on-line dehydration: the opportunity to extend service life. Applied in the field, a wet transformer can gradually be dried out and kept dry. 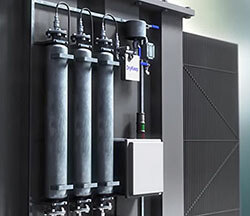 Applied on a new unit at the factory, or in conjunction with major repair in a service shop, a permanent on-line dehydration system can be used to perpetuate a factory dry state, removing moisture as a factor affecting service life and electrical performance. This is of course, the best strategy to safeguard service life-and electrical performance: avoiding long periods of moisture build up; ideally, keeping the paper insulation factory dry throughout its service life. DryKeep® USA has introduced the new and improved SMART (SCADA Monitoring Analysis and Reporting Technology) design that now includes permanently installed moisture-in-oil sensors and a PLC-based monitoring and control system. The operator interface will display the moisture in parts per million (ppm), oil temperature, system status and alarms, pump operation, and flow integrity. Read more. We reserve the right to make changes to any described details and technical data contained herein without notice. Continuous product enhancement by DryKeep® and local conditions may also result in deviations.